100% cotton, 245g/m2 post wash. 75€ for a size 6. Light-weight, pleasant in hand wrap. This wrap breaks in easily and will therefore be perfect from day one. Joyful little Hands in our Aqua Grad. Glides well in both single- and multiple layered carries. 60% cotton / 40% natural bamboo, 220g/m2, 85€ for a size 6. You will find them on windows. And probably on your walls too. Tiny prints, all unique. We hold our kids' hands, to guide them as they grow. Precious moments, that you will remember forever. Introducing you to our new Hands wrap. 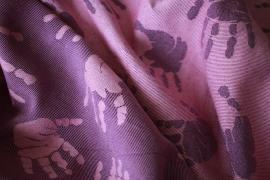 A soft combination of purple and rose, in a lovely bamboo blend wrap. Our natural bamboo, also called bamboo-linen, is easy to wash and can be treated like a linen wrap. After washing and ironing, you will notice the pleasant, cuddly feel of this wrap. It feels light in hand, is very easy to wrap with and perfect for newborns. The bamboo gives the wrap extra strength, so it will be no problem either to carry your bigger kids. 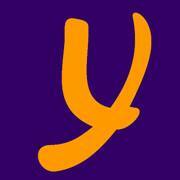 Yaro Slings is a manufacturer of woven baby slings produced within the European Union. Our motto - affordable woven slings to promote the babywearing and the great quality! Yaro Slings has been created by the initiative of a group of European babywearing consultants who would like to promote the babywearing and make it affordable.